Guess who wrote a decent print ad the other day? Remembering Pakistan's most iconic Alexander ad. Artist Majeed Ahmed was the art director on this print ad, in what I believe is probably the finest Pakistani pairing ever of the classic model of copywriter-art director. This was an era when art directors such as Helmut Krone in the United States had started changing advertising design models quite drastically, stripping them down to a page’s bare essentials and Majeed Ahmed’s art direction is in keeping with the simple, yet effective, minimalism that Krone had advocated. The Alexander Ad doesn’t just signify the boldness with which Pakistani advertising presented itself in the past, it also highlights something much more significant: respect given to the reader. There is a sort of mutual understanding here: I, the writer, will write something clever, because I know you, the reader, appreciate reading something clever. In 1968, a young writer named Javed Jabbar sat down to write a tourism ad campaign for Pakistan. Those were very different days in Pakistan, and there was much to celebrate; the national airline, for instance, was counted among the best in the world and didn’t require duct tape to hold its engines together. There was a promise of a brighter tomorrow. During these heady days, Mr Jabbar wrote five ads in this particular wonderful tourism campaign, one that is – to borrow the words of Paul Beatty – as timeless as a hydrogen atom. Tellingly of the era, two of these were written for East Pakistan. All five were witty, interesting and engaging – traits that the Pakistani advertising industry somehow has decided to leave out of its briefs over the years. Of the five, it is the fifth in that series of print tourism ads that I want to discuss, to give an idea of the history of advertising in the country. When you look at the history of advertising in Pakistan, the majority of work – especially in the modern era – simply doesn’t match the standards the rest of the world aspires to, despite the ever-rising budgets for production. It wasn’t always like this. There have been many gems along the way, and every once in a while, even now, you get to spot something that gives you hope. But the true golden era of Pakistani advertising was back in the 60s. Back when folks like Mr Jabbar sat down at their typewriter. 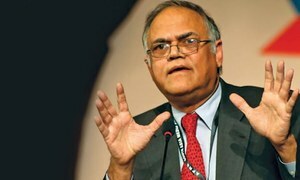 The brief for the tourism ad, says Mr Jabbar, was “broad”. But from the outset the goal was that the campaign would make both Pakistanis and foreigners aware of all that was to be celebrated. The print ad in question is astonishingly simple. It works off of a classic device that would make Don Draper giggle with joy: a highly-engaging trick of ‘visual-verbal coordination’, which in this case was as razor sharp as the hand-eye coordination inside-left Naseer Bunda exhibited in the goal that won Pakistan a gold hockey medal at the 1960 Rome Olympics. Heady days. Artist Majeed Ahmed was the art director on this print ad, in what I believe is probably the finest Pakistani pairing ever of the classic model of copywriter-art director. This was an era when art directors such as Helmut Krone in the United States had started changing advertising design models quite drastically, stripping them down to a page’s bare essentials and Majeed Ahmed’s art direction is in keeping with the simple, yet effective, minimalism that Krone had advocated. It’s important to note this: a print ad such as this one would have been appreciated anywhere in the world. 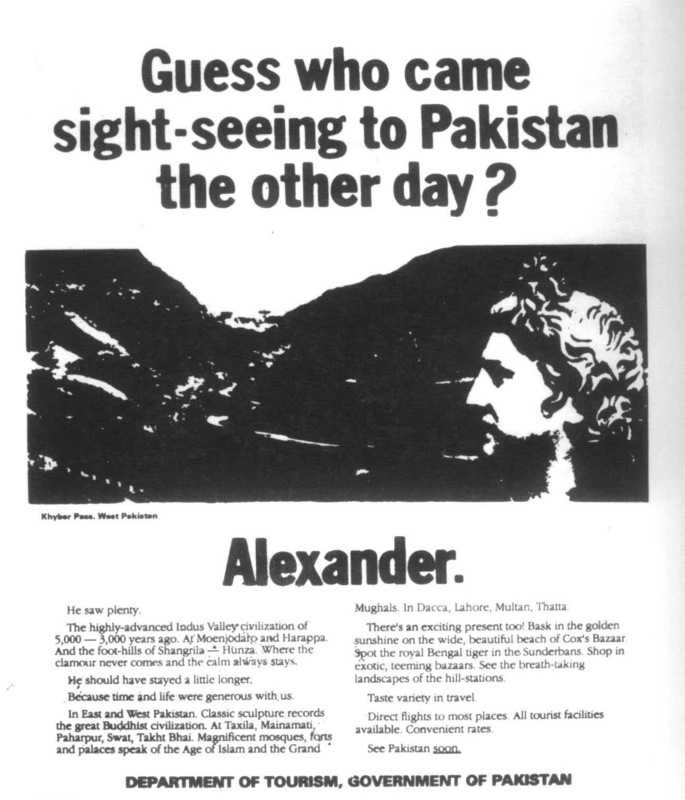 In the ad itself, a bold headline asks the reader a casual question: ‘Guess who came sight-seeing to Pakistan the other day?’ And the visual answers it on the eye’s path to the remainder of the headline: a bust of Alexander the Great looks out over the majestic Khyber Pass. ‘Alexander’. The body copy reads like a page you would find in a good novel: inviting, engaging, with its potent pauses delivered through the design element of a paragraph break. It starts with a powerful, pithy line: ‘He saw plenty.’ There is no over-the-top sales pitch here; just somebody having a conversation with you. Neatly stacked in two columns to make it easier to read, the words fit the space perfectly. You can tell that this was organised by a man who knew how to set type, not by somebody who did it by selecting a drop down menu. There’s no logo. Or at least there isn’t a graphic logo (and with it, one must deduce, no discussion of ‘make the logo larger’). A modest line states that the ad is coming from ‘the Department of Tourism, Government of Pakistan’. And much like the design systems brought about by Krone’s legacy, the layout is painfully simple: headline, visual, body copy – a third of the page to each. It’s beautiful in its form. It’s effective in its function. While seemingly simple on the surface, there is a great deal of complex thought in this advertisement. The counter-positioning of the phrase ‘the other day’ against somebody like Alexander is of course what provides humour: a smile in the mind, as they say. It is casual, cheeky and audacious in its confidence. “There are very few examples of thoughtful advertising today,” said Mr Jabbar when I spoke to him about this campaign, the sort of sadness in his voice that one feels when they realise another great campaign is lost in the industry’s Bermuda Triangle known as the boardroom. “Today’s ads, mostly driven by commerce, don’t take risks and don’t provoke.” There is, tragically, much truth in this. It’s not all doom and gloom though. Much like its film industry, Pakistan has clawed back and made some fantastic strides in advertising creativity over the past handful of years, led by a handful of determined creatives. The country has won top gold at advertising’s own Olympics: Cannes Lions, Effies and Clios, and promises to push for more work to be recognised internationally. Agencies are at least striving to produce more work that is clever, which will certinaly lead them into a new phase. Pakistan went through a massive transition when TV advertising was introduced in the 60s, opening up the canvas to more experimentation and creativity. 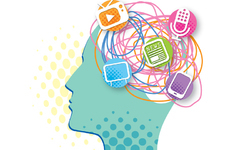 I feel that when TV advertising, as we know it now, moves from traditional broadcast – a medium in which you can force a viewer to watch content – to digital, a medium in which the viewer has more control and choice over what to watch but with an attention span of 2.8 seconds, we will see a new era emerge which will demand content that is smarter, more engaging and cleverer. Much like the Alexander Ad. I thought, well, that would make for a decent print ad. Ali Rez is Regional Creative Director, BBDO Middle East and Pakistan. It would be nice if we could read the content of the ad. This ad is truly timeless. Before reading the article I read the ad and was surprised that the tourism industry has actually come up with such a pleasant ad. Then I found out that it was published 50 years ago. Thanks to Aurora Dawn and specifically Ali Rez for sifting thru the AD archives and picking this Pakistan Tourism AD. It surly is a classic specimen. Javed Jabbar and my cousin, late Majeed Ahmed (may his soul rest in peace) were undoubtedly the best copywriter art director duo Pakistan ever had. 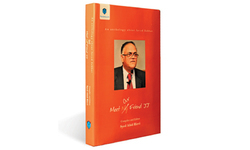 Together, they created numerous advertising campaigns that were simply phenomenal. I strongly suggest, that someone in Pakistan curate and organize gems like this from other AD agencies as well and create an AD museum.